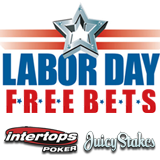 Intertops Poker and Juicy Stakes are celebrating America's labor movement and the contributions that workers have made to American prosperity this Labor Day by giving all players 50 free bets on casino games this Monday. Intertops Poker and Juicy Stakes players get 50 free $1 bets on any Lucktap casino game in the poker room. Each free bet is for $1. A maximum of three free bets can be made at one time. Players can win up to $250 on their free bets and will have three days to play through their bonus and convert it to cash (wagering requirement 15X). Intertops Poker and Juicy Stakes are the busiest poker room on the Horizon Poker Network, making them popular with poker players all over the world.